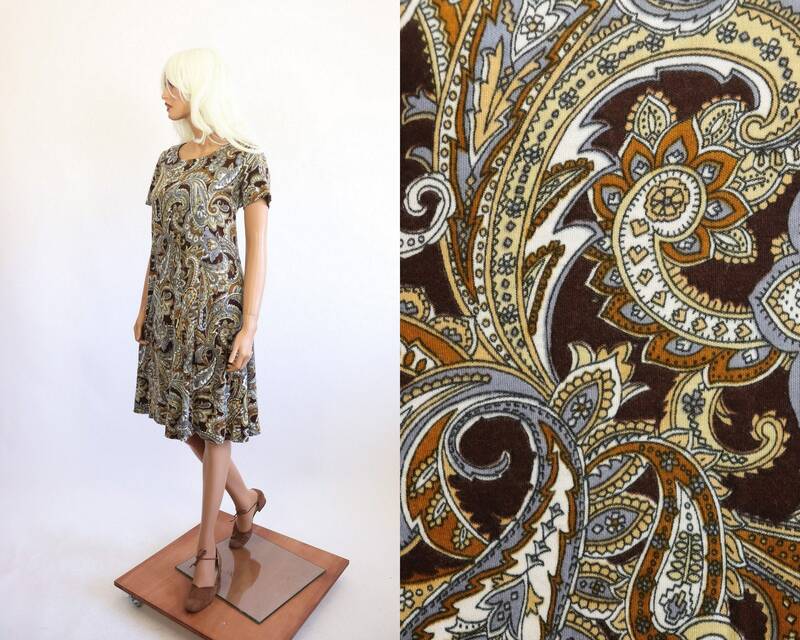 Adorable 60s paisley dress. Beautiful, soft and comfortable jersey knit. Features autumnal brown tones. Would look cute belted too. Such a versatile piece! Condition notes: In great vintage condition. Shipped so incredibly fast and is in amazing vintage condition! Almost looks like it was never worn. Does not smell weird and has almost no yellowing! Overjoyed with my purchase and I will definitely be back! Couldn't have asked for a better experience! Didn't know this was the thing I needed until I saw it, love it! Perfect, as described and well packed! We accept payments through paypal (credit card/debit card/paypal account), etsy direct checkout, and gift cards. We will also hold/reserve an item for you for up to two weeks!!! Item over 100 dollars? We can do layaway! Please note: Residents of Ohio will be charged a 7% sales tax. All sales are final. Please Please Please read all measurements and the entire description BEFORE purchasing. We are very thorough! If for some reason there is a screw up, convo us first. We’ll do our best to make it all better! If in the event that satisfaction is not met items can be returned for store credit. We've been working hard at aiming to prepare and package items to ship same day, so because of this we are no longer accepting cancellation requests. All United States orders are sent first class or priority, depending on weight. If you would like your packages insured let us know, and we can give you a quote on the price. International shipping can be sent First Class (the cheaper way) or Priority (the safer and faster way) If you want your package to have insurance and tracking you must upgrade to Priority shipping. Please be aware of your country’s custom policies before purchasing. Some countries have a fee or put a tax on imports and packages coming from other countries. We have no control over this. This is the buyer's responsibility. Please contact your local post office if have questions concerning how your country handles imported packages. We will not falsify customs forms by marking as a gift or lying about the packages worth. Please do not ask us to do this this. It is illegal and carries hefty fines and even jail time. On the Prowl is not responsible for packages lost in the mail. Please consider having your purchase insured. 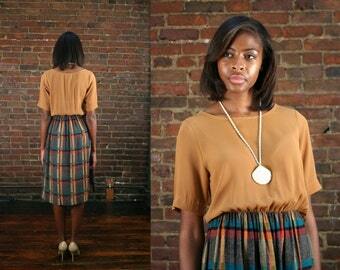 Remember you are buying vintage clothing that is 20 years or older. These items will show some age and wear, and unless noted as deadstock they are not in brand new condition. We inspect each piece before it is shipped, but please remember small imperfections are common in vintage clothing such as a broken thread here and there, light hanger stretch, a slight fabric flaw, or minor fading in colored fabrics. Also keep in mind that vintage sizing is quite different from modern day sizing. We have found the best way to figure out if a garment will fit the way you like it to is to take a measuring tape and compare to something similar already in your closet. If you would like additional measurements that are not already listed don’t ever hesitate to ask! Please keep in mind that computer monitors display colors and contrasts differently. For instance a blue dress might look differently on your computer from your phone. Additionally your computer monitor may be displaying contrasts, colors, or brightness differently from my monitor. Even more tricky some colors do not translate well into the camera compared to the human eye. Colors are close representations, but are never 100% exact. If you need something specific in color please contact us so we can make sure you will be happy with the product in real life! If you are unfamiliar with vintage clothing and need some guidance feel free to ask us any questions - we’d love to help. We are vintage fanatics over here!